Welcome to the only site which compares the UK's two main charts. Click the "Year End Charts" page to request the various Official chart of the year and stimulate your memories of the 80's, 90's and "naughties" . . . ! We're delighted to announce that we've finally caught up on the backlog of Year End chart e-mail requests! At least 30 have been "bounced back" to us as "invalid e-mail addresses", so if you have made a request during 2017 or 2018 and haven't received a response, please can you make a fresh request and we'll try to respond within 7 days. Don't forget, that "Retro" charts can be viewed at The Official Chart Company's web site, but if you still require a specific week's "Comparison" chart since 17th March 2002, then let us know. We're back! We will publish the whole year's charts for the 12 Days Of Christmas (25/12/2018 - 05/01/2019), allowing you to download any missing charts you may require for your collection. Due to lack of interest, we have temporarily suspended the Chart Quiz, but if enough of you make a request, we'll bring it back again at a later date. Thanks for your visit and interest in . Due to time constraints, we've decided to drop the "Retro" chart request facility, as you can obtain everything from the vastly improved Official Chart Company web site. Any requests which have been made will still be honoured when time permits - don't forget to check out the "Guest Chart" page, which will continue to show this week's chart from either 5 - 40 years ago. 2002 - 2018: Celebrating 16 years of ! What were YOU getting up to during this week: 5, 10, 15, 20, 25, 30, 35 or 40 years ago? Check out our "Guest Chart" and hopefully, we'll trigger some happy memories for you! Want to know what was number 1 when YOU were born? Find it quickly and easily in our "UK Number 1s" page! If you were born between 11th November 1952 and 28th September 1987, our unique guide covers the period of the CHART, not the week endings! 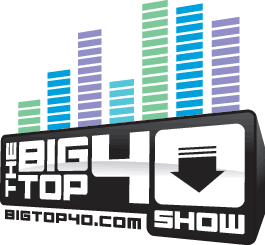 From 14th June 2009, our Chart Comparison features the only real-time chart from "The Big Top 40 Show", which replaces Hit40UK on the UK Commercial Radio Stations! To mark the 8th year of UKPopCharts, our "requestable" Retro charts now cover 36 years! So you think you know your charts? Give our new Two in one "Chart Quiz" a try! Amazingly, it's a year since the "Retro" and "Year End" charts switched to becoming available by e-mail request. Starting 7th September 2008, we are introducing "Guest Chart", which will feature one of the current week's "Retro" charts for 1974, 1979, 1984, 1989, 1994, 1999 or 2004. Like your "Retro" songs? They might be making a comeback! Click here to find out more! Do you own a Nokia mobile phone? If you do, please see the third message in our Message Board and if yours is one of the models listed, check your battery's serial number from the link supplied to ensure yours doesn't go up in smoke! The various Thames Radio 281 jingles are back by popular demand! "Year End" charts are available by e-mail: Why can't I view these charts anymore? Are you brave enough to share your "Guilty Top 5 Songs" with and our regulars? Join Greg James for the Official UK Top 40 countdown, every Friday, between 16:00 and 17:45 (4 and 5.45 pm GMT). Join Marvin Humes for The Big Top 40 Show, every Sunday, between 16:00 and 19:00 (4 and 7 pm GMT), on your Independent Local Radio Station. published each week along with a random Retro Chart for the same week every year from 5 - 40 years ago!